Extra: Participation fee EUR 350 (Euros). When the workshop ends, we select some of our best pictures from the stay and prepare those images for an informal group exhibition locally. While learning about photography the participants explore Icelandic culture by taking part in it, capturing it and also by displaying their work during the camps. One of our objectives is to deliver messages and draw the attention to the locals through pictures made in the camp. Participants should be prepared for walking and visually exploring the city streets and working within a flexible time schedule. Participants will be photographing in their free time outside of workshop hours with images to be discussed at group feedback sessions. Participants should arrive ready to shoot and should bring with them their own digital cameras, lenses, laptops and tripodes if possible. The camp is open for participants older than 18 years old. 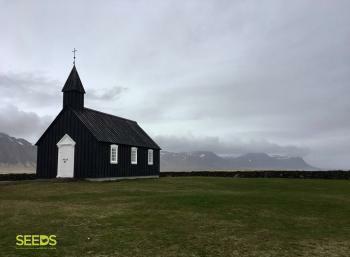 SEEDS coordinators organise a programme combining learning, sharing, getting to know Iceland, its culture, having fun, as exploring the capital city and some of the most stunning nature attractions in the Golden Circle excursion, which will be part of the camp. The camp happens around the summer solstice, when the sun hardly sets and the nights are almost as bright as the days. The bright nights are magical and staying awake enjoying the beautiful surroundings is a unique experience. During the time of the camp participants will have the opportunity to experience the midnight sun as there are 24 hours of light even if the sun sets for shorts periods of time. LOCATION: Reykjavik is a dynamic, modern city which lives in harmony with beautiful nature, using renewable energy sources. The world’s northernmost capital bridges the Atlantic, between Europe and America. The city is spread across a peninsula with a panoramic view of the mountains and the Atlantic Ocean on almost all sides. Reykjavík is often called “the nightlife capital of the north”, but there is more than pubs and clubs, it also gathers the most interesting of Icelandic culture and is an incubator of ideas & styles which often indicate new trends. EXTRAS / SPECIAL REMARKS: Participation fee EUR 350 (Euros), which can either be transferred in advance via bank transfer, or paid for on arrival. The fee includes transportation from the meeting point to the camp and back into SEEDS office (on the first and last day), as well as the Golden Circle excursion. Meeting time will be 18:00 (6:00 pm) on May 23 at SEEDS Office in Reykjavík. Participants that cannot arrive on time (later or delayed flights) will be sent information on how to reach the camp on their own.